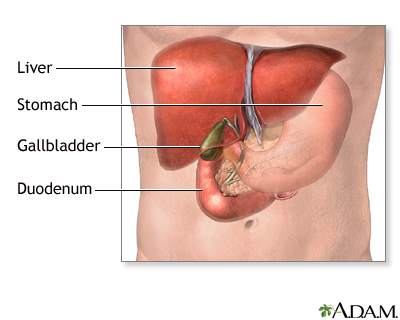 The gallbladder is located in the abdomen, on the right side, underneath the liver. The gallbladder stores bile produced by the liver, and delivers it to the first part of the small intestine (duodenum), where it aids in the digestion of fat. 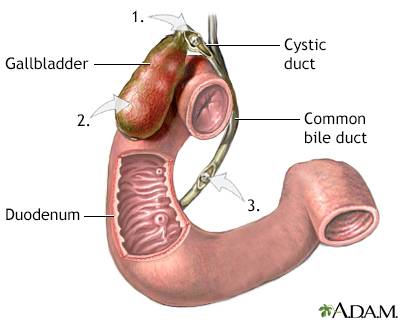 The cystic and common bile ducts connect the gallbladder to the duodenum-bile passes through these ducts from the gallbladder to the duodenum. Gallbladder surgery is done to treat gallbladder disease. 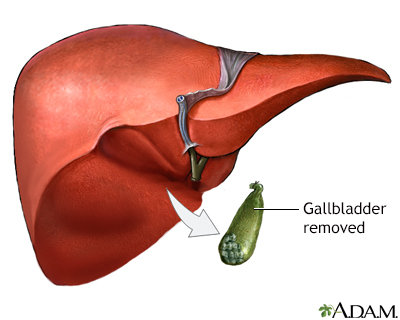 Gallbladder disease is commonly caused by the formation of gallstones in the gallbladder (cholelithiasis). Gallstones can affect different locations. Obstruction of the cystic duct leading to severe abdominal pain (biliary colic). Infection or inflammation of the gallbladder (cholecystitis). Blockage of the biliary ducts leading to the duodenum (biliary obstruction). In each case, the gallbladder is often removed (cholecystectomy). 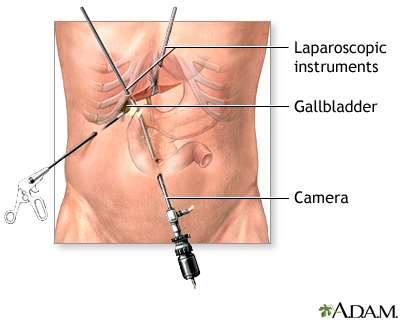 Most gallbladder surgery today is done using laparoscopic surgical techniques, in which narrow instruments, including a camera, are introduced into the abdomen through small puncture holes. 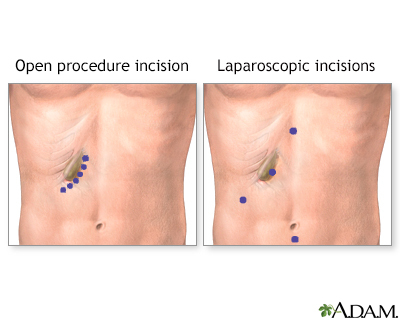 If the procedure is expected to be straightforward, laparoscopic cholecystectomy may be used. A laparoscopic camera is inserted into the abdomen near the umbilicus (navel). Instruments are inserted through 2 more small puncture holes. The gallbladder is found, the vessels and tubes are cut, and the gallbladder is removed. If the gallbladder is extremely inflamed, infected, or has large gallstones, the abdominal approach (open cholecystectomy) is recommended. A small incision is made just below the rib cage on the right side of the abdomen. The liver is moved to expose the gallbladder. The vessels and tubes (cystic duct and artery) to and from the gallbladder are cut and the gallbladder is removed. The tube (common bile duct) that drains the digestive fluid (bile) from the liver to the small intestine (duodenum) is examined for blockages or stones. A small flat tube may be left in for several days to drain out fluids if there is inflammation or infection. Most patients who undergo laparoscopic cholecystectomy can go home the day of surgery or the next day, and resume a normal diet and activities immediately. Most patients who undergo open cholecystectomy require 5 to 7 days of hospitalization, are able to resume a normal diet after one week, and normal activities after 4 to 6 weeks.